Ever since Donald Trump all-but secured the Republican nomination for president (after the Indiana primary in May of last year) there’s been a great deal of speculation as to when the inevitable challenge to his leadership of the GOP would materialize. Most of the anti-Trump conjecture originated from establishment figures such as John Kasich, John McCain and Jeb Bush, people who never fully accepted Trump as a legitimate politician and have sniped and criticized him from the sidelines as the New York outsider dove in and battled the reptile-infested political swamp in Washington DC. To predict someone from the elite circles of the party will make a high-profile primary challenge to Trump in 2020 is not only within the logical realm of possibility — it’s almost likely to happen. Certainly such an effort would be well supported and financed by Trump’s multitude of enemies inside and outside the party. But could Trump possibly face opposition from a conservative competitor as well? Some people talk as though it’s destined to take place. Radio host Mark Levin has been similarly critical of Trump’s political inconsistencies, so it isn’t just Shirley and Mauer making the challenge-from-the-right argument. Since Shirley is perhaps the preeminent authority on the extraordinary life of Ronald Reagan it’s understandable how he might see parallels between what’s happening with Trump today and the internal party civil war (between American conservativism’s greatest icon and the ultimate establishmentarian of his time, Gerald Ford) that took place over forty years ago. And while it’s true Trump has been making a number of debatable political moves of late it’s probably a little early to foresee a certain conservative primary challenge to his leadership of the GOP in 2020. Trump may have earned the ire of diehard conservatives who felt the sting of his apparent backtracking on immigration a couple weeks ago but by no means is it obvious that he has morphed into a knee-jerk reactionary Democrat. Many (myself included) surmised Trump’s overtures to the opposition party were really a feint to throw the media dogs off his scent rather than signaling a permanent exodus to join the enemy’s black hooded thugs. Trump is far too tactical and clever to be so open about his true intentions; he’s also reiterated time and again “I will not let you down” to his base. All the media and liberal adoration in the world isn’t going to lure Trump away from his desire to please the crowds. That’s what a populist does; when you stop satisfying people you become un-popular. If you don’t believe it, ask George W. Bush. It just doesn’t make sense to believe otherwise in Trump’s case. The president may be no Ronald Reagan but he certainly doesn’t appear to be a Gerald Ford either. After the fiasco with Richard Nixon in the mid-70’s the GOP establishment took full control of the party and of Ford’s governing direction. There’s little to no chance of something similar occurring with Donald Trump. Trump remains ever distrustful of the entrenched ruling class in Washington. He’s been perhaps too tolerant of keeping Obama holdovers employed in the highest reaches of the federal bureaucracy but when Trump has had the opportunity to appoint someone, he’s usually turned to worthy conservatives. It’s also hard to envision how one of the high-profile conservative leaders in Congress (or governors) would become so upset with Trump that they’d make what would likely amount to a suicidal run to unseat him on the 2020 ballot. Such a campaign would need to begin sometime soon, too, otherwise there wouldn’t be sufficient time to organize, fundraise, hire a staff, etc. And who would it be? Ted Cruz? Mike Lee? Ben Sasse (there isn’t anyone on the House side who would be prominent enough to make it work)? The former two would be highly unlikely to challenge Trump for a number of reasons. Cruz is currently preoccupied with winning reelection next year and Lee has never seemed interested in a run for the top White House job. Of the group Sasse would be most likely to try it, but again, where would his base of support come from? The conservative/populist grassroots chose Trump precisely because he was seen as having the best shot at breaking up the system, an impression that is not likely to fade no matter what takes place in the next couple years. Practically speaking, there aren’t enough voters to fuel the fires of change in the GOP away from Trump at this point. One name who could conceivably attempt it just to make a statement is Senator Rand Paul. Paul’s family’s political history would lend itself to running an outsider-from-the-inside-type campaign that would highlight Trump’s policy apostasies and could draw a reasonable amount of support from libertarian conservatives and those who have never thought Trump was conservative enough. Further, the Kentucky senator has been plenty vocal lately in questioning his party’s turn away from conservatism. In a piece titled “Remember When Republicans Were Conservative?” Paul wrote last week in The Daily Caller, “Our budget needs balancing. Our programs need reform. Our spending ourselves into debt needs to end. “With this next three months, conservatives, and really all Republicans, need to get together and act. We need to insist that there will be no debt ceiling increase the next time if we aren’t heard, and if reforms aren’t enacted. It’s clear Paul intends to follow through on his principles and could become one of Trump’s loudest Republican critics if the president carries out his threat to approach the Democrats for additional help in passing legislation under the guise of doing anything to get the process moving. It’s also well-known Paul was a leading conservative opponent of compromise on the repeal and replacement of Obamacare which has many folks questioning his motivations. Most principled conservatives agree wholeheartedly with Paul’s words and positions but at some point politics does become the art of the possible. There’s a difference between using one’s position outside the majority to take a stand (as Ted Cruz did against Obamacare in 2013), but once you’re in the governing faction it’s necessary to bend a bit at times. In the end I don’t believe Paul would pursue such a run against Trump. He’s not his dad and circumstances are quite different than when Reagan challenged Ford in 1976 and even when “pitchfork” Pat Buchanan campaigned against George H.W. Bush from the right in 1992. Bush was Reagan’s VP, the establishment had retaken control of the GOP and Buchanan didn’t have enough of a base to knock off the elder Bush. Perhaps most importantly, the conservative Republican voters weren’t ready to toss out Bush. They won’t be prepared to remove Trump at the ballot box either. The biggest reason is Trump is by and large keeping his promises. Even the establishment is now hesitant to criticize his methodology. “’In relates to NATO, look, here’s a place where the rhetoric actually has been helpful,’ Bush said during a foreign policy discussion hosted by United Against Nuclear Iran. One wonders whether Jeb now believes it was okay to shake up the GOP’s “complacency” last year when conservatives and populists roundly rejected the status quo in favor of the politically unrefined Donald Trump. Trump doesn’t talk like a typical politician and isn’t the least bit afraid to step on foreign toes – like those of NATO leaders – to advance his America First policies. Trump’s tough rhetoric is not only popular with Americans in general it’s extremely well received by conservatives. We still have a long way to go until 2020, but for right now it’s hard to fathom how the outsider president would face a conservative primary challenger after one term. Shirley quotes a 1985 statement by Gingrich, “The biggest division in the Republican Party… is between those who are serious about building a majority party and those who are locked into the mentality of a minority party.” Another quote from his 1979 campaign, where he charged that the Republican Party had not “a competent national leader in his lifetime. The GOP did not need another generation of cautious, prudent, careful, bland, irrelevant, quasi-leaders.” Sound familiar? Are you tired of the bickering, fighting, and failure to produce results in Washington? Do you want to know what it takes to implement conservative principles in the Congress and the executive branch? 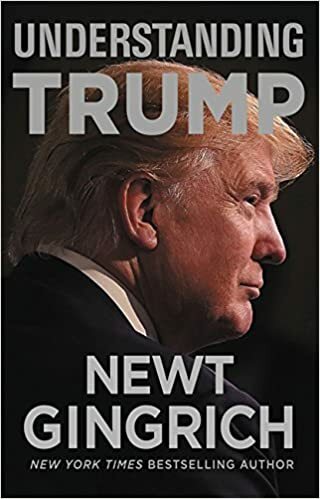 Then consider reading Craig Shirley’s new book, Citizen Newt: The Making of a Reagan Conservative as a source of historically factual insights and principles. Candidly, it is difficult to review a book written about yourself. In fact, it is a little embarrassing. However, Craig Shirley is a widely respected historian of American politics, and I know from personal experience how many years he has dedicated to this project. I therefore feel I owe you serious commentary about this book – the first authorized biography of my political career. Craig is truly a remarkable historian. His four volumes on Ronald Reagan are the definitive biography of our nation’s 40th president and a vital history of the conservative movement in the final decades of the 20th century. As someone who campaigned with candidate Reagan in the 1970s and worked with President Reagan in the 1980s, I know how insightful and accurate Craig’s books are. His book December 1941 is an astonishingly detailed, day-by-day account chronicling America’s entry into World War II. Even as a historian who has written two novels about Pearl Harbor, I found myself learning a surprising amount of new information from Craig’s detailed account of this period in American history. The hallmarks of all of Craig’s works are extraordinarily thorough research and biting commentary about both Democrats and Republicans. His work on Citizen Newt is no exception. Craig spent countless hours at The University of West Georgia extensively reviewing all of the documents filed in my archives. He interviewed countless key players and sat down with me to revisit key moments and incidents in my career. While Craig is a friend, he is honor-bound as a serious historian to be tough-minded about the mistakes and failings of his central figures. He was tough on Reagan when he deserved it, and he is equally tough on me about some painful errors in my career. Craig is especially tough on the establishment Republicans who undermined the Reagan-Gingrich movement (as Nancy Reagan described it in the 1990s). He is also fiercely contemptuous of the liberal reporters and writers who simply lie and make up phony stories and falsehoods to undermine, limit, or distort the history of modern conservatism. In that way, Craig’s books are always about issues much bigger than the personalities in the title. He is a historian of the conservative movement and a loyal protector of historical fact from liberal and establishment distortions and dishonesty. When Craig was nearly finished with Citizen Newt he sent me a copy to review. He was concerned about any factual errors but made clear he was not going to allow me to soften any of his judgments — even when they were critical of me. My greatest reaction to reading the book was how exhaustive Craig was. He spared no detail in constructing his narrative and reliving those years of my career was exhausting for me personally. I had forgotten how many things myself, Jack Kemp, Bob Walker, the Conservative Opportunity Society House members, and our activist allies had done. We put an end to 40 years of Democratic control of the House by earning the majority in 1994 – but it took 16 years of agonizing, unending hard work. The Contract with America was not a lucky fluke – it was the culmination of a long project that endured many missteps, frustrations, and failures before reaching its historic turning point. 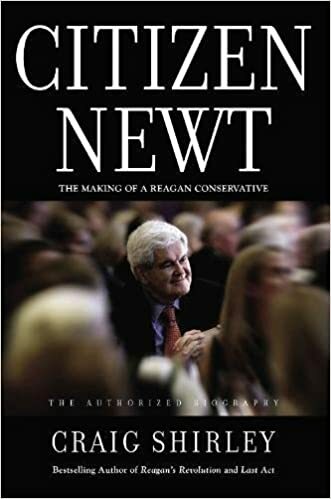 If you want to understand how Reaganism was turned into a second wave of conservative innovation and change through the House of Representatives, Craig Shirley’s Citizen Newt is a must-read. Everyone who is unhappy with the current Washington process will find clues to a better strategy in this extraordinary book.